Though its origins are rooted in antiquity, the practice of a bride covering her head and or face during part or all of her wedding ceremony remains a very common custom in modern marriage celebrations, regardless of the cultural or religious background of the bride and groom. 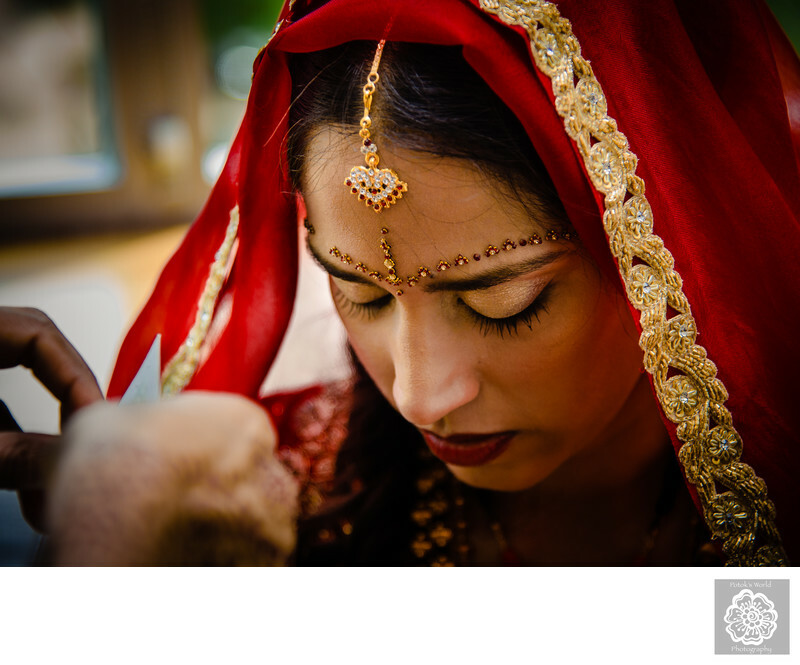 We have photographed Catholic, Hindu, Muslim, Greek Orthodox and Protestant wedding celebrations in the Washington, DC, metropolitan area, and have taken pictures of brides in veils in almost all of them. Brides who tie he knot in Christian or Western-style wedding ceremonies, for example, will almost always wear a bridal veil. Sometimes it will cover her face during the early portions of the marital event, and either the father of the bride will lift the veil after he delivers his daughter to her future husband or the groom will pull it back after newlyweds exchange their vows. In other wedding celebrations, brides will choose to wear a veil that flows back, covering their hair but leaving their faces uncovered throughout the ceremony. Traditional Muslim women obviously keep their entire heads out of the view of their wedding guests, but even more liberal brides will typically wear some sort of veil during Muslim marriage celebrations. Hindu wedding customs vary widely depending on which part of India the bride and/or groom’s families come from, but in many variations of a Hindu marriage celebration, an Indian bride will wear a dupatta, a beautiful silk wrap that is worn in such a way that the hair is covered but the face is generally left free. The bride in this particular photograph is in the process of putting just such an article of clothing on before she goes out to meet her future husband at the wedding ceremony at the Silver Spring Civic Center in suburban Washington, DC. As widespread as the custom is, it is perhaps not surprising that the bridal veil appears to have served the same purposes in all the cultures in which it is common: shielding the bride’s hair and face from the view of the assembled wedding guests and symbolizing her purity and virginity. That aspect of the tradition (which many might find excessively old-fashioned) tends not to play such a large role in modern marital celebrations, but the wearing of a bridal veil has a particular significance nowadays that wedding photographers like us love. Putting on her veil is one of the last things that a bride does before leaving the venue in which she has gotten ready and heading to either her first look or her marriage ceremony. It is the final step in her preparations and a completion of her wedding dress and makeup. More significantly, we have noticed that putting on the veil symbolizes that the bride is ready mentally and emotionally to go out and get married. Location: Silver Spring Civic Building, 1 Veterans Pl, Silver Spring, MD 20910.